Today’s fantastic guest is none other than Chris Peach from the Money Peach blog and podcast! He’s fantastic in audio format, totally pro, and has an amazing story behind his content (and life). Enjoy, and make sure to take the challenge below in the comments! In this day and age, it can be rare to find a content creator so open and honest about their journey, and also one not afraid to do a few things unconventionally. Chris Peach is one of those rare guys. For one, he knows what he’s doing when it comes to teaching his content, AND growing his platform. Second, he’s a firefighter, and his wife’s a TV anchor, making them perhaps the coolest couple ever? Making it DIFFICULT for people to join your email list. How he’s grown his blog and podcast. Chris has a lot to say, and I’m glad he does. I LOVE the passion and energy he brings to everything he teaches. I don’t know if these captions are working, but if so, please pin me! Head to iTunes and leave me an honest rating and review! 1 star, 5 stars, doesn’t matter. It takes 2 mins MAX, and it helps me better the podcast! Do yourself a huge favor and grab Chris’s free budget worksheets and guide HERE. ACT NOW and head to https://www.awesomemoneycourse.com/pete for $200 OFF Chris’s A+ money course! Drip – Email marketing Chris uses. #2 I’ve seen recommended behind CK. FinCon – Read my blogging takeaways from LAST year’s FinCon here. You can run 4 giveaways a month, spend $5,000 in FB ads, and make your home page one big opt-in form…and probably grow an email list pretty quickly. However, many (not all) of new subscribers may not be of the caliber you want. Not too ironically, you might actually gain the same number of true fans a month if you make it a tiny bit harder to opt-in to your list. Should you bury your single opt-in on a random blog post from 2 years ago, hidden with CSS tricks? Not at all. But you might require a bit more effort none the less. J.D. Roth does not promote his opt-in forms front and center on his site, stating he prefers a small sacrifice of growth in exchange for a higher caliber of subs. Chris Peach requires a phone number in addition to name, email, etc. I require a name in addition to an email. Even this last one should hit home on our point…it’s the tiniest bit of extra effort to put both your name AND email address when subscribing to someone’s newsletter. Sure, your shiny list number might grow a tad slower, but hopefully the “stickiness” of new subscribers will be a tiny bit greater. There’s no right answer, but great food for thought. 2 – 1,000 true fans. First, if you’ve never read Kevin Kelley’s full article (link)…stop everything in your life and go read it. It’s quality, and might actually change your life on a serious level. Did you read it, or have read it in the past? K, good. It’s NOT worth me rehashing the main points on this post. What is worth mentioning is how seriously Chris applies the “1,000 true fans” philosophy to his own business. We get SO caught up in the digital marketing hustle sometimes (I sure do), and find ourselves focusing on growth growth growth with little regard to anything else. We’d all do a bit better to slow down, take our time, and NAIL the different aspects of our content and marketing in order to optimize for nurturing true fans. I’d be a lying dog if I claimed this were easy, and that I’d completely done it myself! Gaining 1,000 TRUE fans is like working your way up from little league to the New York Yankees. That is to say, slightly easier than working your way up to the Atlanta Braves. But seriously. It’s the work of years, not months. Be a human in an online world. A “scalable” action in an action that can be repeated with the same amounts of effort, for an unlimited (or at least higher) amounts of transactions. SaaS companies are built for scale. They build software products that cost marginally less, and consume marginally less time…as more and more users pick up the product. Sending mass broadcasts to an entire email list. Pretty much anything 1 on 1 and/or deep with a single person or organization. Legendary anchorman (I’ll never stop using this reference) Pat Flynn is notorious for calling a few of his readers every month. Now why would Pat, owner of a 7-figure business with MILLIONS of readers, subscribers, and listeners take the time to do that? He and his reputation/fame probably makes a true fan every dang time he does this. The large majority of his readers do NOT share his blogging success, so it’s increasingly important that he remain connected and close to them! 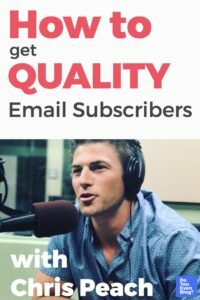 Can you manually reach out and thank each of your first 1,000 email subscribers? Can you skype with a reader every week? Or month? Find activates that can drastically increase your positive connection with fans, even if they won’t scale to 10,000 readers. Chris is a member of an impressive mastermind group with some amazing bloggers. One has to make themselves available to other people in order to uncover these unexpected opportunities. Chris wouldn’t have found his way into the mastermind had he not wandered into the bar, it’s true. He ALSO wouldn’t have found his way in had he not gone to the conference. Many of us might be introverted, or otherwise unwilling to invest in building real relationships with other people in our niche. Ok, well, yeah, so, that’s like, not good, ya know. Great opportunities “present” themselves to those who SHOW UP. Success doesn’t find anybody sticking in their little comfort bubble. Challenge: Comment below with ONE idea for connecting with a reader (something that doesn’t scale). Thanks for the shoutout on the episode, Pete! I love the idea of connecting with at least one reader a week via email, phone, text, etc. Great episode!